Forget Fortnite - if you want your kids outside this summer getting a top trampoline is a sure fire way. Few outdoor pastimes are more rewarding, from both a fun and fitness perspective, than the good old trampoline – and there's load out there suitable for most budgets. We’ve scoured the web, read a raft of user and professional reviews and generally spent more time than we should have researching the very best – and safest – trampolines so you don’t have to. The result is this splendid quintet of joyous jumpers - but first, a few questions to consider. What sort of safety features should I look out for? Firstly, make sure to spend as much as possible on a good quality model that will last more than a couple of winters. It should have sturdy legs that won’t topple over if a child, teenager or adult crashes into the safety net, and the edge safety mat (or end deck) should be of high quality with plenty of padding that completely covers the springs and all parts of the frame. Ideally go for a model with a safety net that attaches to the edge of the bed (the trampoline’s woven polypropylene jumping surface) rather than the edge of the frame. 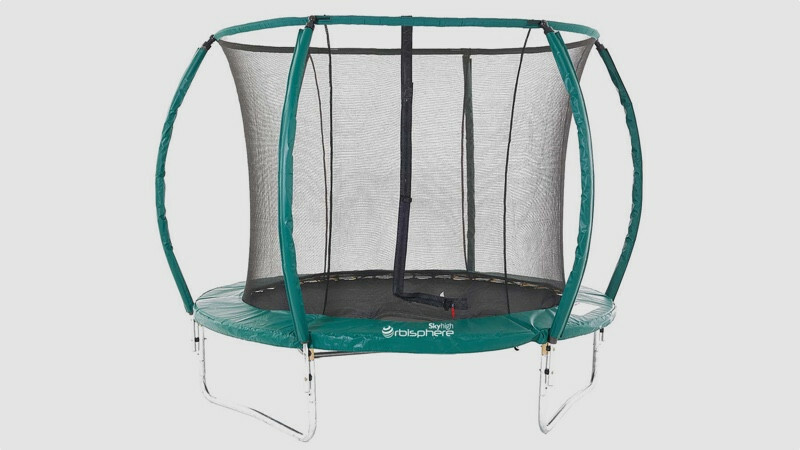 What type of trampoline is best? 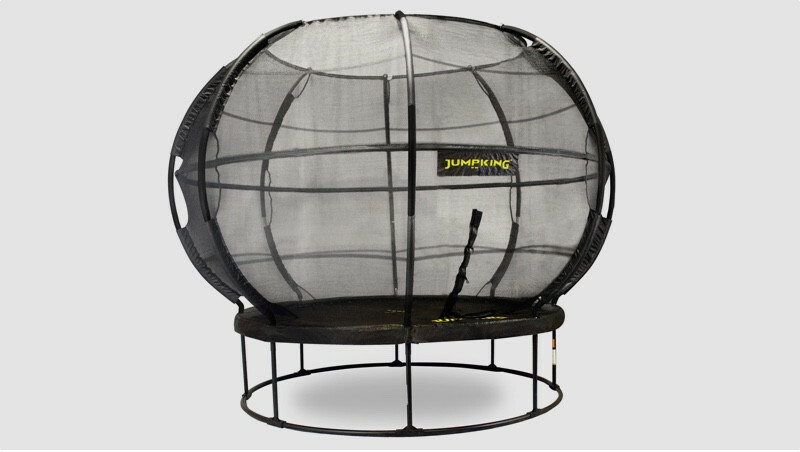 There are several styles of trampoline, from small mini rebounders for low impact exercise, rectangular, oval and circular frame-based models for garden use and, for those who are prepared to have a large hole dug into the lawn, the aesthetically pleasing in-ground model. 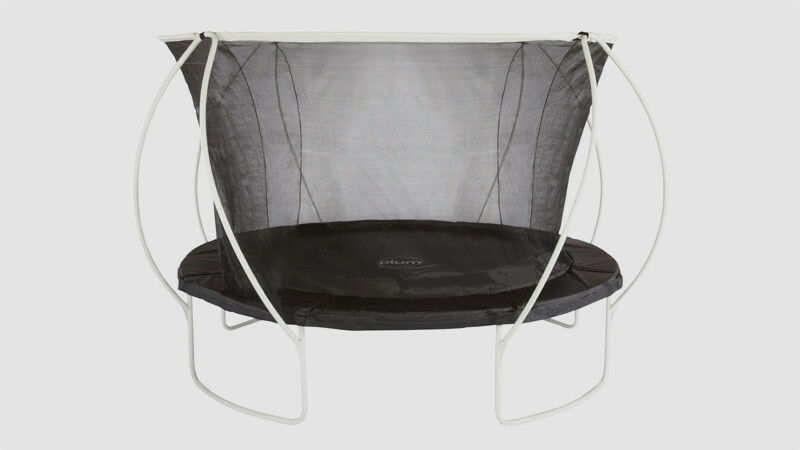 A rebounder or mini-trampoline with attached handlebar is perfect for toddlers and very small gardens or patios, but make sure to have some soft protection on the ground if placing it on a hard surface. Most recreational trampolines are of the above-ground variety and there’s a huge selection of different models out there to chose from. Circular trampolines are the most popular since they take up the least space; they’re usually available in sizes ranging from 8ft to 14ft (2.5m to 4m). If you have more real estate to play with, consider an oval or rectangular model since these allow for three or four children to bounce at the same time. They’re also a safer bet when it comes to performing tricks and aerial gymnastics. Bear in mind that if you position the trampoline over grass, the whole area below it will eventually die off due to lack of sunlight, leaving an unsightly circle of brown earth. Now you know a bit more on the subject, it’s time to dip into our reviews. Plum is considered one of the most popular and dependable manufacturers of recreational garden trampolines. Winner of the Junior Design Awards, this 10ft version comes with innovative spring protection that completely separates the user from the springs and the frame. Moreover, the heavy-duty, coated steel frame struts that hold the top of the catch net in place are bowed outwards in a wide arc so that there is no chance of anyone making contact with the frame and causing injury. Likewise, the long-lasting UV treated spring cover beyond the enclosure is extremely well padded and firmly secured for excellent protection. As is the case with most adult-friendly trampolines, bounce resistance is quite firm so the heavier you are the higher you’ll bounce. Nevertheless, this 6-years+ model has excellent bounce-ability. The Latitude is superbly designed from top-quality materials, is easy to assemble and competitively priced. And when winter comes, simply remove the netting and cover the trampoline bed with the included cover to keep leaves and other garden detritus at bay. Top buy. If you’re on a tighter budget then consider a model from this well-established, family-run company. The 8ft Orbisphere is a perfect choice for youngsters and beginners and comes with many great safety features, including sturdy legs, a safety net attached to the inside of the spring mat and good-quality spring protection. 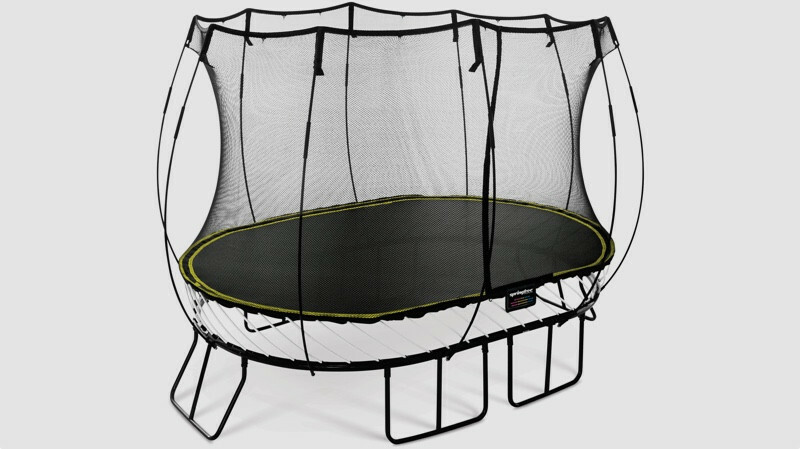 This trampoline uses more springs than many other manufacturers and the springs used are also longer than the norm (165mm as opposed to 135mm). This combination gives the Orbisphere supreme bounce, which smaller and lighter children will certainly appreciate. The jumping surface itself will support a weight limit of 100kg. In the pantheon of budget contenders, the Orbisphere tickets all the boxes: it’s well constructed for the price, it addresses the majority of safety issues and it’s plenty springy. It also comes with a five-year frame warranty for extra peace of mind. If you’re looking for a high-quality, large surface garden trampoline that shouts space-age style, then this is the one for you. The 12ft ZorbPOD is far and away the coolest looking model in this roundup and one that no self-respecting teenager will sniff at. Its highly-sprung 12ft bed and solid framework allows for impressive aerobatics and high altitude jumps. And, because it has a taller-than-average enclosure, there’s practically zero chance of clearing the net and ending up in A&E. As it should be, the net itself is secured between the main bed and the padded springs so there’s very little possibility of a leg slipping through the springs. The ZorbPOD is easier to assemble than most because its construction doesn’t require any tools; you simply slot one bracket into another until it’s formed a complete circle (the same goes for the enclosure frame). Bear in mind that you’ll need about 18 circular feet of garden space to accommodate it safely but, once up, your kids will completely abandon their tablets and consoles and you may have trouble getting them back inside. UK-based Springfree has developed a completely different – and unique – style of trampoline that eliminates the dangerous impact points that are the cause of most trampoline injuries. Instead of a hard steel frame and a cordon of skin-pinching springs, this oval-shaped model uses a clever system of composite rods that flex at an angle when put under load. The trampoline still has a frame but it’s positioned beneath the jumping mat, way out of harm’s way. This, combined with a safety net that attaches to the very edges of the bouncing surface, ensures a much higher level of safety than a traditional model. It also provides more bouncing space and, because there is less metal used in its construction, the trampoline has a longer lifespan. This 8ft x 11ft oval model doesn’t take up too much garden estate and has two sweet spots for two kids to enjoy jumping without colliding into each other. Some trampolinists have remarked that springless models are not quite as bouncy as traditional trampolines but we beg to differ. In the arena of recreational models, it’s one of the bounciest and safest on the market. But it comes at an extraordinarily high price and that will doubtless dissuade all but the most well-heeled, safety-conscious of buyers. 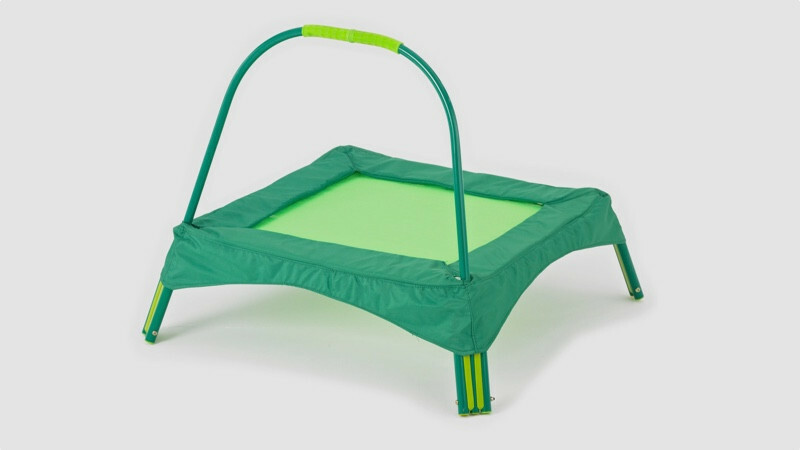 This mini bouncer is a perfect introduction to trampolines for one year olds and a great low-impact method to strengthen little legs and bones and improve balance. But above all, it’s a barrel of fun. This Early Fun model comes with a sturdy handlebar and a decently padded surround. Its small 89cm x 89cm footprint also means it can be used indoors. The Early Fun isn’t very high off the ground, so as long as it’s positioned on a soft, flat surface, the risk of injury is minimal should a child fall off. Sadly, mum and dad will have to suppress the urge to jump on board because its weight limit is just 25kg.